Here's another design that I made using 22 mm swarovski crystal copper twist bead as highlight along with two smaller (14mm) twist beads. 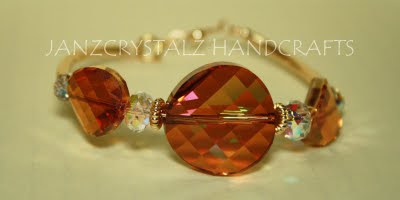 Accented with swarovski crystal rondelles beads and 14/20 gold filled components. wow, another elegant design. do you sell ur stuffs online? Beautiful! Do you sell them or make them for personal use? Visiting via Thursday Brownies. Hope you can visit my blog. I sell them po pag may mag order..:) thanks for the comments. dropping by from Thursday Brownies! hope you can drop by at my gelatissimo and my espresso!see yah!